Gemstones are known to have the ability to assist in healing the body when used in meditation. 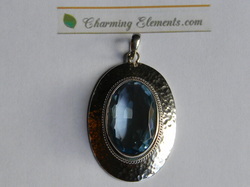 When worn as pendants, the gemstone can help transmute negative energy to positive. Find out what your gemstone’s properties are. Crystal Quartz is the most powerful healing stone on the planet. The unique helical spiral crystalline form makes this stone an energy amplifier. It absorbs, release, stores, regulates, and unblocks energy. 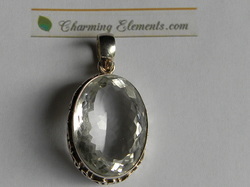 Crystal quartz attune you to your spiritual purpose. Physical healing: Quartz is a master healer for any condition. It stimulates the immune system, while bring the body into balance. 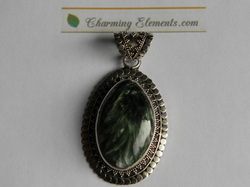 Seraphinite is a stone of spiritual enlightenment, and self-healing. this stone has an angelic connection which will assist in identifying the changes needed in life to put you on the tranquil path of fulfillment. Physical healing: Seraphinite can release muscle tension and overcome chills. Fire Agate is a protective stone building a shield around the body.This stone returns harm back to it's source so that the source can understand the harm it's doing. Fire Agate dispels fear, and instills security. Physical healing: This stone helps with stomach, and circulatory disorders. 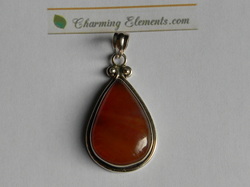 Also Fire Agate reduces hot flashes, and prevents energy burn-out. Obsidian stimulates growth on all levels. It assists you in exploring the unknown, which opens a new horizon. It also protects against negative energy. Blue Obsidian aids astral travel. Physical healing: Blue obsidian if placed over the spot alleviates pain. It assists to treat speech defects and personality disorders. Amber is not a crystal. It is a fossilized tree resin. Amber has a strong connection with the earth that draws disease out of the body. It stimulates the intellect, and brings wisdom. 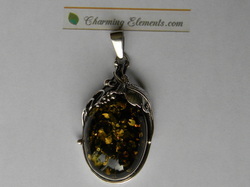 Physical healing: Amber allows the body to balance and heal itself. It assists with the healing of stomach, spleen, kidneys, bladder, liver, and gallbladder. 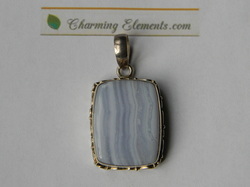 Blue Lace Agate is a nurturing and supportive stone. It neutralizes feelings of anger and counteracts menal stress. It is particularly effective in healing the throat chakra. Physical healing: It is a throat, neck, and shoulder healer. Blue Lace Agate also strengthens the skeletal structure, and aids in healing of fractures. Moonstone is a stone of a new beginning. It soothes the emotions while calming irrational impulses and hyperactivity. 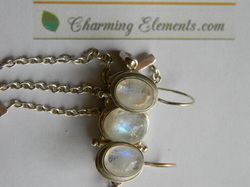 The Moonstone has a powerful effect on the female reproductive system. Physical healing: Moonstone helps the digestive system, eliminate toxins, assimilate nutrients, conception, pregnancy, childbirth, breast feeding, and PMS.